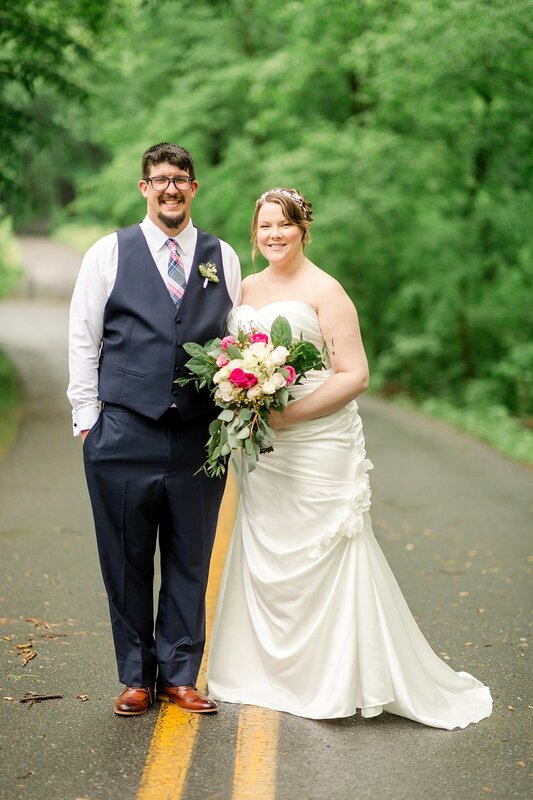 Beth and Patrick got married this past weekend at Lancaster County Central Park. 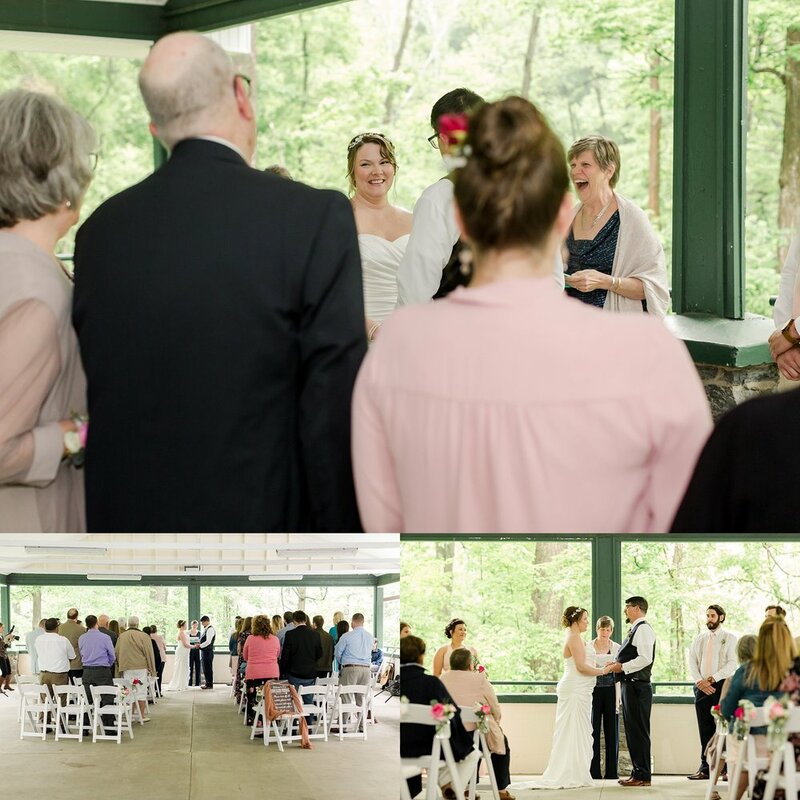 Initially, they had planned an outdoor ceremony overlooking a stream and nearby covered bridge, however, Mother Nature had alternate plans for us! It became clear early in the day that it was going to be a rainy one. Thankfully, Beth had a weather-contingent Plan B and rented a nearby pavilion within the park. 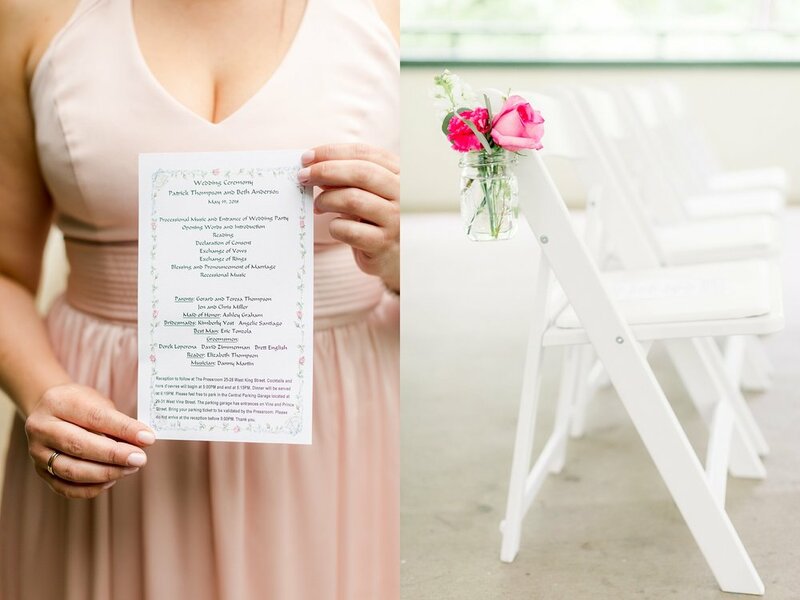 They had their ceremony at Pavilion #21, which was just perfect for their intimate ceremony surrounded by nature. 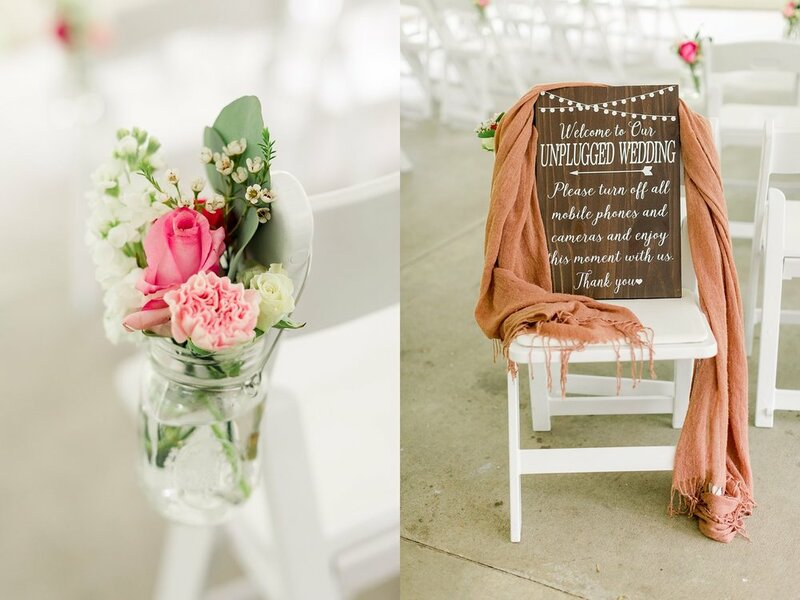 Their friends pitched in to help set up the space which was decorated with crisp white chairs and mason jars full of flowers which highlighted the center aisle. It was such a happy occasion and even the rain didn’t dampen the day! 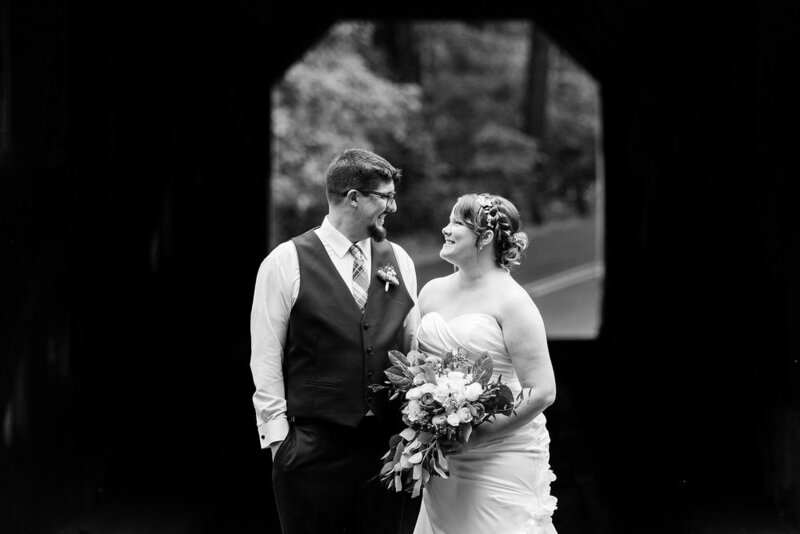 We started our coverage of their day with a "First Look" in a paved clearing near the pavilion. 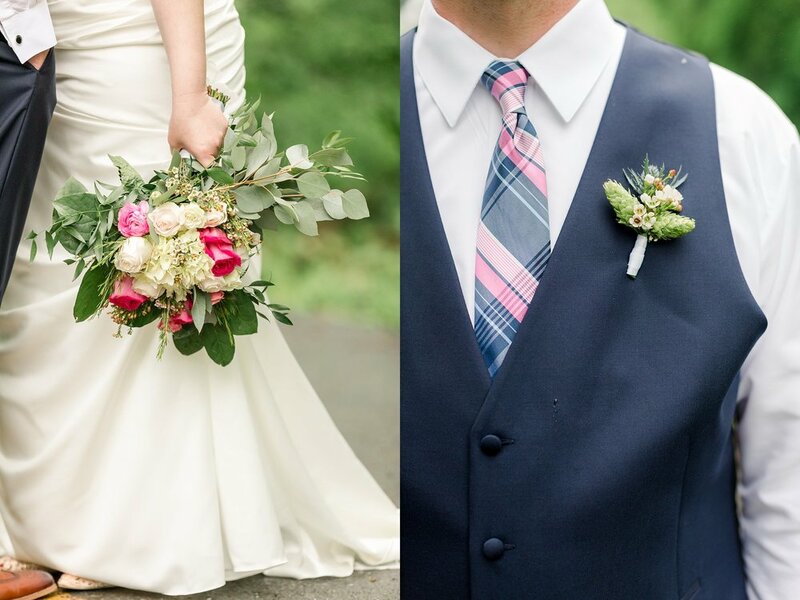 I just adore the layers of foliage captured in the images of them sharing a sweet moment together before their ceremony. The ceremony was an intimate service with their closest friends and family looking on as they exchanged their vows. Beth's stepmom officiated the ceremony which added such a special touch to the occasion. During the ceremony they had a beautiful reading by Patrick's sister, Elizabeth. It was all just so personal and so meaningful! There was a great moment where Patrick looked up at me just after their first kiss, checking to make sure we had captured it. I gave him a quick thumbs-up and a "we got it!" and he smiled back--I'll never forget that! Following the ceremony, we headed to Downtown Lancaster to grab more portraits of the newlyweds and their bridal party. 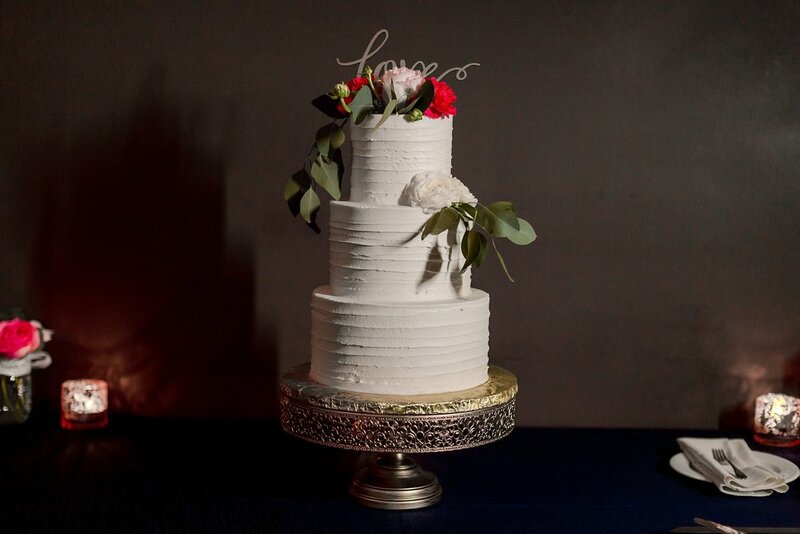 The reception was in a private room at The Pressroom Restaurant. 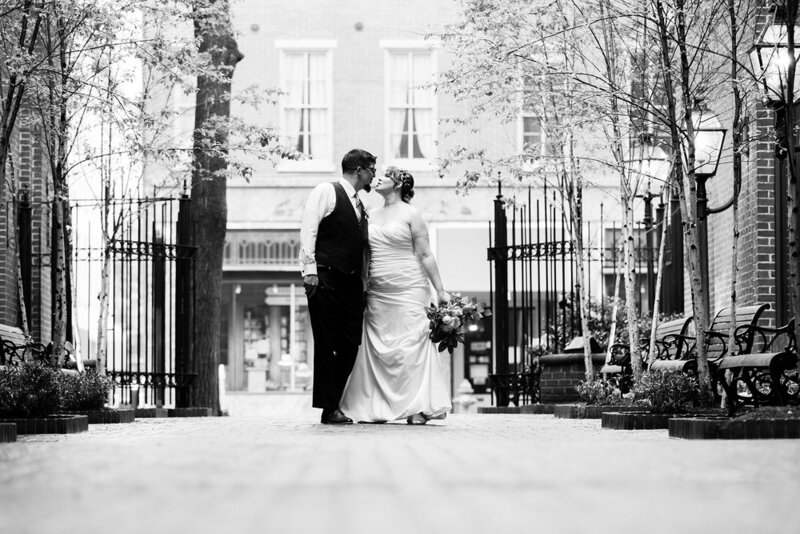 I absolutely loved shooting this Downtown Lancaster wedding because the surroundings are just incredible! 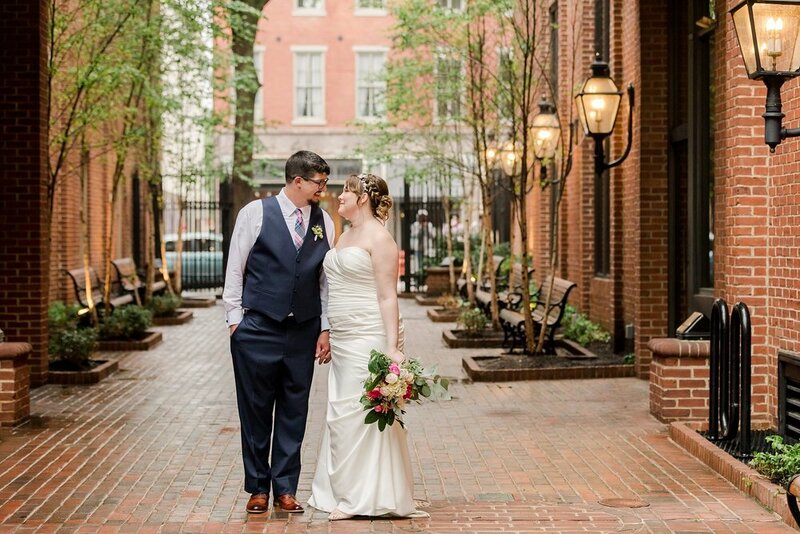 All of the brick walkways and unique streets make the perfect backdrop for some amazing portraits. Their first dance as husband and wife was slow and romantic. There were definitely some happy tears flowing! Beth and Patrick finished off the evening by cutting their gorgeous three-tiered cake and by sharing parent dances with their moms. Beth and Patrick's wedding was so laid back and everything I love about weddings. 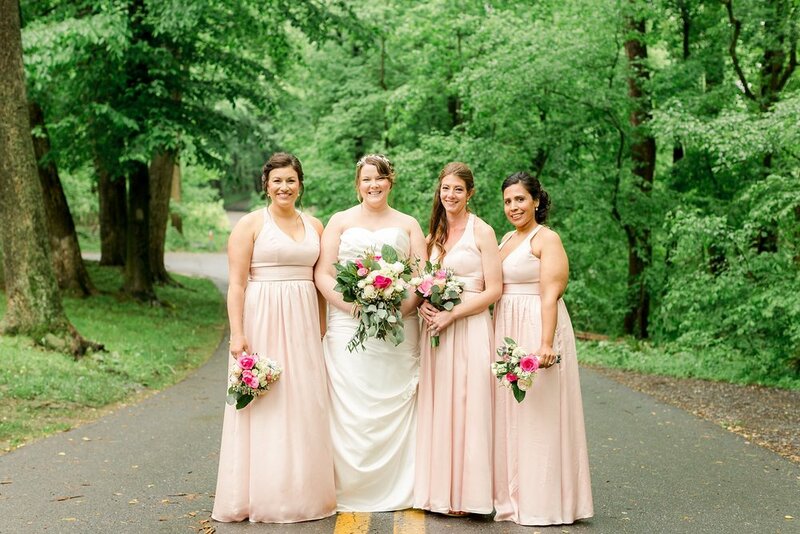 Take a peek at some of the highlights from their intimate Lancaster wedding below! 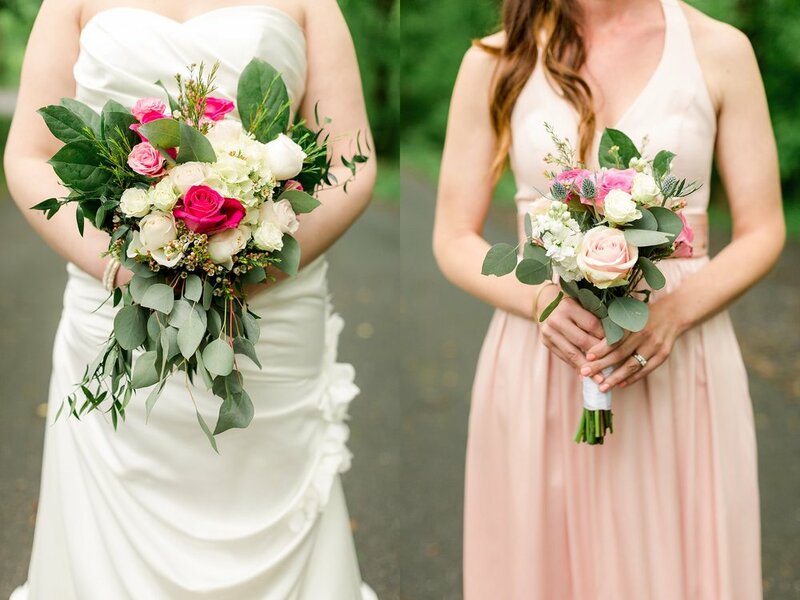 If you’re planning a Lancaster, Pennsylvania wedding, get in touch! A special thank you to my second photographer, Erin, for all of her help in documenting Beth and Patrick's day. Thanks, mama! 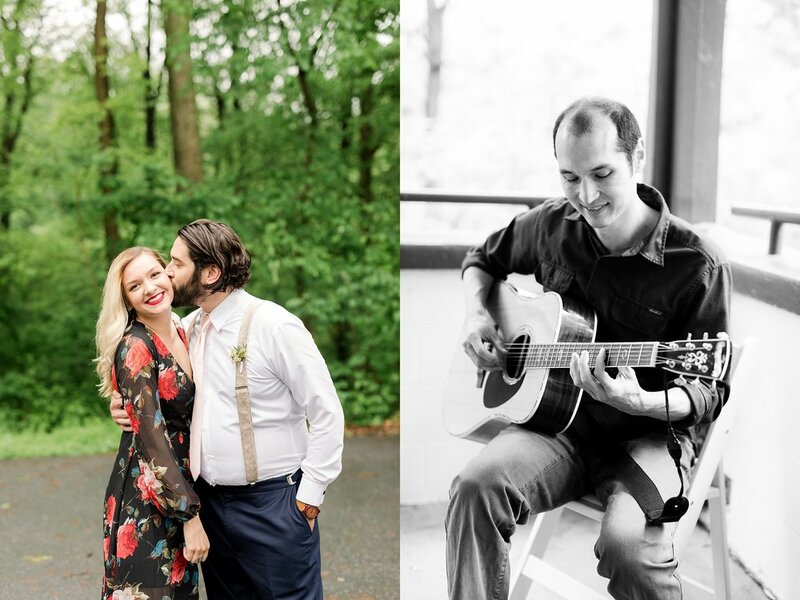 Are you planning your own Lehigh Valley or Lancaster County wedding? Contact Alyssa here. I can't wait to hear from you!